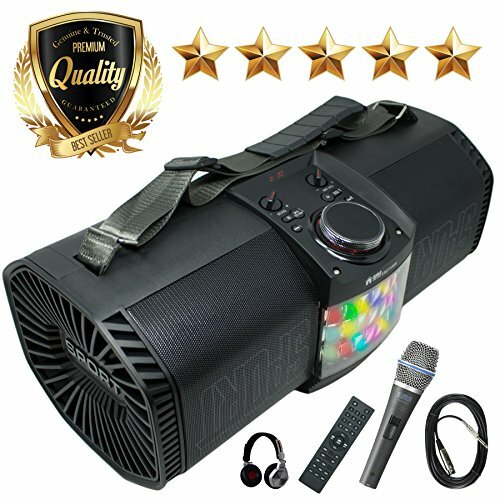 EMB Bluetooth Boombox Street Disco Stereo Speaker - 3600mAH Rechargeable Battery Portable Wireless 300 Watts Power FM Radio/MP3 Player w/Remote and Disco Light w/EMB Microphone & Headphone (Black) by EMB Professional at Nebula Fia. MPN: EBZ110BK-PK3. Hurry! Limited time offer. Offer valid only while supplies last. DISCO LIGHT: Party on the go with the built-in Disco Light in the middle that is Sound Activated. If you have any questions about this product by EMB Professional, contact us by completing and submitting the form below. If you are looking for a specif part number, please include it with your message.